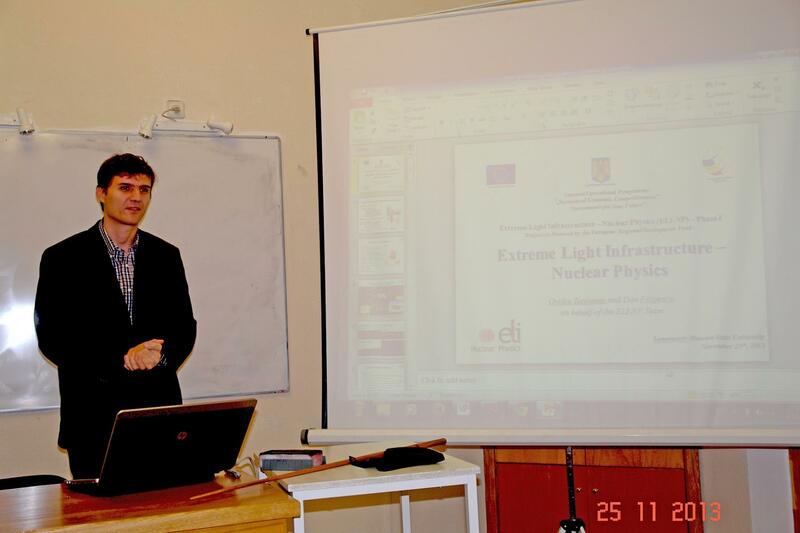 A workshop of the SINP DEPNI scientists and their colleagues from Horia Hulubei - National Institute of Physics and Nuclear Engineering - IFFN HH (Romania) - the Head organization of the European Project Extreme Light Infrastructure - Nuclear Physics on the development of high-energy source of monoenergetic gammas took place in SINP MSU on November 25-26, 2013. Dr. Dan Filipesku and Dr. Ovidiy Tisileanu met with SINP Director and made a presentation during the DEPNI seminar. The materials are presenated on site Nuclear Physics in Internet (http://nuclphys.sinp.msu.ru/). They discussed the possibilities and perspectives of SINP MSU participation in the international collaboration on the project and signed a joint Memorandum of understanding.